A relatively small country along the Bay of Bengal, Bangladesh is nearly surrounded by India and has been shaped by it. 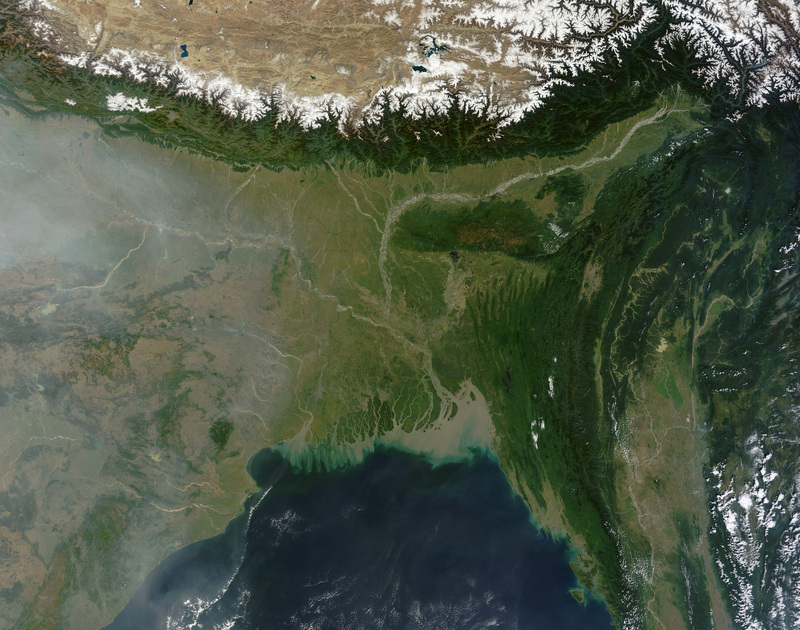 Between 40 and 50 million years ago, India collided with Eurasia, elevating the Himalaya. 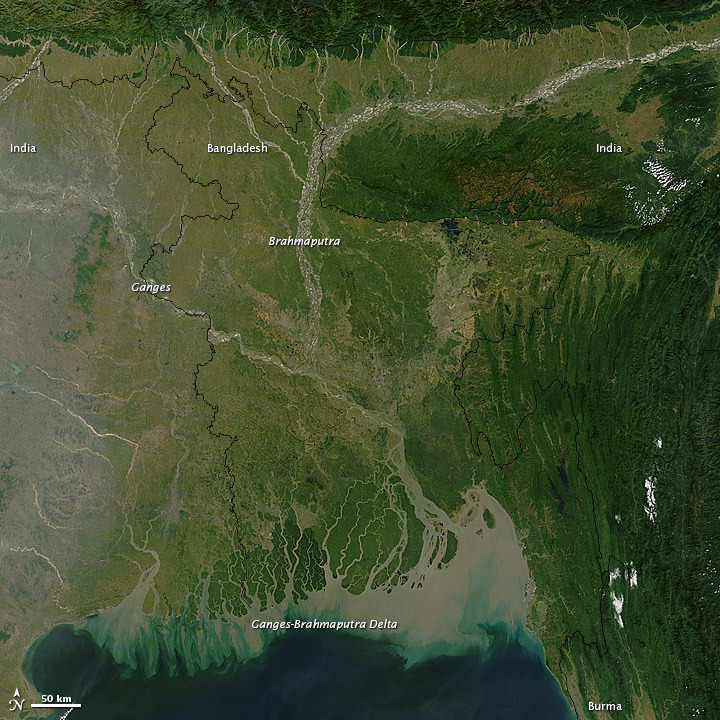 Eroded by wind and water, the newly uplifted land shed sediments, which now cover almost all of Bangladesh. Tectonic activity also deformed rock layers in eastern Bangladesh. 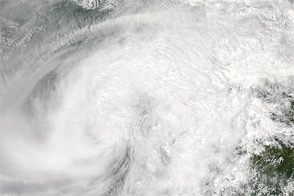 On November 9, 2011, clear skies allowed the Moderate Resolution Imaging Spectroradiometer (MODIS) on NASA’s Terra satellite an unobstructed view of Bangladesh. 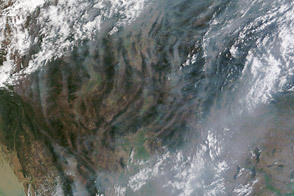 This natural-color image shows all of that country, as well as parts of India, Burma (Myanmar), and the Bay of Bengal. Included in the scene are the Sundarbans of the Ganges-Brahmaputra Delta. The Geological Survey of Bangladesh explains that most of the sediments covering the country are geologically young—deposted in the last 10,000 years. Deltaic silt and sand and mangrove forests dominate the southwestern part of the country. Sand and gravel cover the northwestern parts. 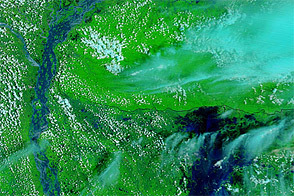 Northeastern Bangladesh is covered by a combination of clay, peat, gravel, and sand. Some of the most visually striking landforms occur along the border between southeastern Bangladesh, India, and Burma. Here, the land appears folded in accordion fashion. The U.S. Geological Survey explains that eastern Bangladesh is underlain by oceanic crust that is slowly subducting beneath the Burma Plate. As the oceanic crust slides below, overlying sediments are scraped off, forming elongated folds of land. Whereas most of the sediment elsewhere in Bangladesh has been deposited in the last 10,000 years, some of the rocks in southeastern Bangladesh date back as much as 20 million years. 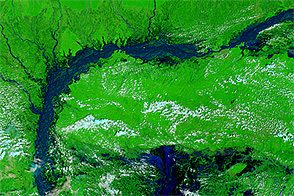 Bangladesh was shaped by an ancient continental collision and thousands of years worth of sediment rolling down from the mountains. Geological Survey of Bangladesh. (2001). Geological Map of Bangladesh. (PDF file). Accessed November 10, 2011. U.S. Geological Survey. (2001). Bulletin 2208-A: PeteroBangla Cooperative Assessment of Undiscovered Natural Gas Resources of Bangladesh. (PDF file). Accessed November 10, 2011.